This is the story of Louis, who never quite fit in, and of his younger brother, who always tried to tag along. As they got older, they grew apart. And as they got older still, one of them got cancer, and the other became his caretaker. Then they became close again, two brothers on one final journey together, wading through the stuff that’s thicker than water. Told in anecdotes as his brother remembers them, we discover who this cranky, cancerous Louis once was. That before his brain surgery he had a mind that was said to be bigger than the rest of the family’s put together, and that his heart was—and still is—just as big. That it’s hard getting a haircut with a brain tumor, and that it does no good to help your brother memorize a PIN number when he might not be able to remember where the bank is. We learn along with these two brothers how the little stuff is as big as the big stuff, how tragedy and comedy go together, and how necessary it is that they do. 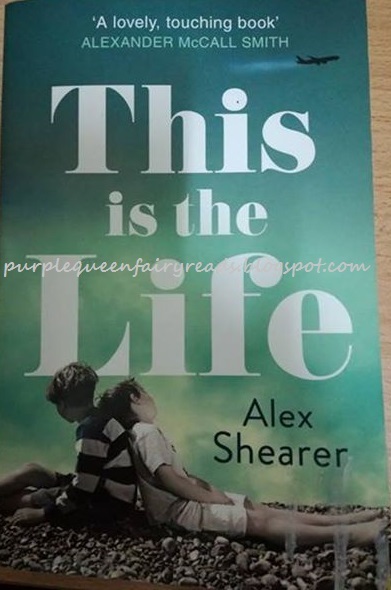 Inspired by Shearer's experiences when his own brother was dying and written with a warm touch that is at once tender and achingly funny, This Is the Life is a moving testimony to both the resilience of the human spirit and the importance of the simpler things in life, like not taking a dying man’s tea kettle away. I read this during the new year break as 2017 becomes 2018. I thought it would be something uplifting and positive and motivating. It certainly wasn't uplifting. It was quite sad but not sobbing type of sadness but more like sad because of opportunities lost, sad because of words not spoken and sad because the opportunity would never come again and the words will never be uttered. It wasn't the ideal book to read into the new year but then how am I to know that This is Life would be so. I mean, just by the title alone, it could be a book of life and certainly not of death. Anyway, no regrets. It's just a book.